It was so easy to fall in love with Cambodia. 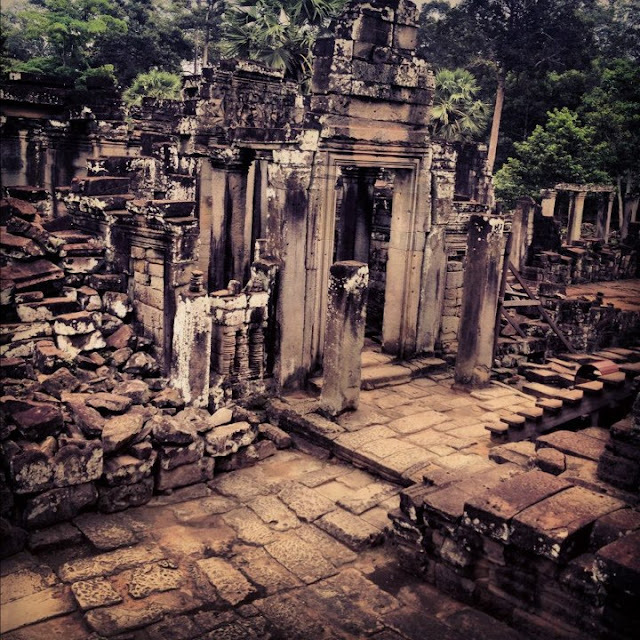 Yes, it’s true Angkor Wat is such a magical place that everyone would recommend you to go, but really Cambodia is more than just about that archeological park. Their nature, people, how cheap foods and drinks there, aaah even the owner of my favorite guesthouse - Mr.Bunkao – and many more makes me want to come back there again perhaps next year. Continue our journey, we stopped by at a small restaurant for lunch. I didn’t eat anything, just walking around and took some pictures instead. Met Ilir Morina, an expert traveler from Germany. You know the conversation would be very interesting when the topic comes to travel experiences, and this guy been all over the world. Lucky ! Me and Ilir stopped in Pnom Penh first before continue the journey to Siem Reap, unfortunately I was running a bit faster than him when the bus stopped us at Pnom Penh, so practically we didn’t meet in Pnom Penh. I stayed at Indochine 2 Hotel – loving their friendly service and bed, tried out noodles and juice at a local restaurant, then had a lovely afternoon walk around Royal Palace. Loved how these Cambodian people gathered at the park in the afternoon, scenes where some women were dancing, little kids were running around, tourist and their camera, the birds, the monks, tuk tuk, and those colorful flags…I sat down having my cheap cocktails at one of the bars, enjoying every movements around me, what a wonderful life ! What I never missed out about going to new places : morning and afternoon walk. I love to wake up early and check out the places before people start again their daily routines, just a quiet morning and me. I didn’t stay long in Pnom Penh, quite rush to go to Siem Reap. The receptionist from Indochine 2 Hotel helped me booking my bus ticket to Siem Reap, like what others recommended, I took Mekong Express bus for another 6 hours journey. 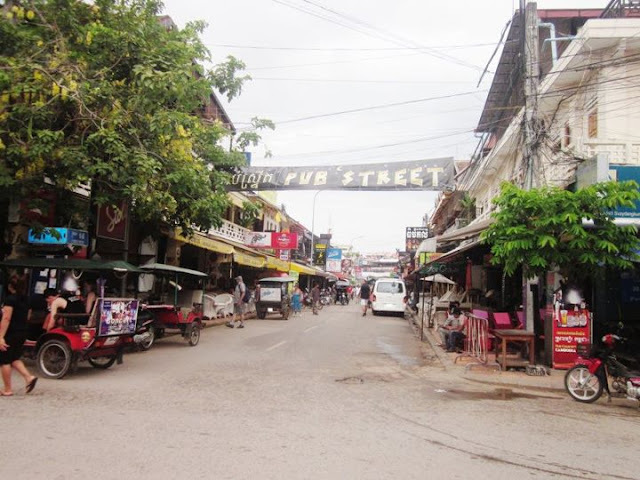 Reached Siem Reap in the afternoon, around 2 pm, I haven’t booked any hostel. Was a bit curious to know what it would be like if I ask the tuk tuk driver to find me places to stay, I knew they would scam me, but still I wanted to know what would happen. Jackie my tuk tuk driver took me to backpackers hotel very near to Pub street, $15 /night, without AC, and they put me in the 4th floor at their second building, dark, way too quiet, it seemed I was the only one staying there. Yes I was afraid, had quick lunch then walked around the neighborhood to find another hotel, then I remember a girl I met in Ho Chi Minh City actually recommended me to stay at Bun Kao Guesthouse at Wat Bo street. I went to check the place, and oooh I fell in love with the warm smile of Mr. Bunkao, the owner of the guesthouse. He was so friendly, made sure all the time I had good times in Siem Reap, he even reminded me to eat properly because travelers gotta be healthy to do the trip, such a nice man. 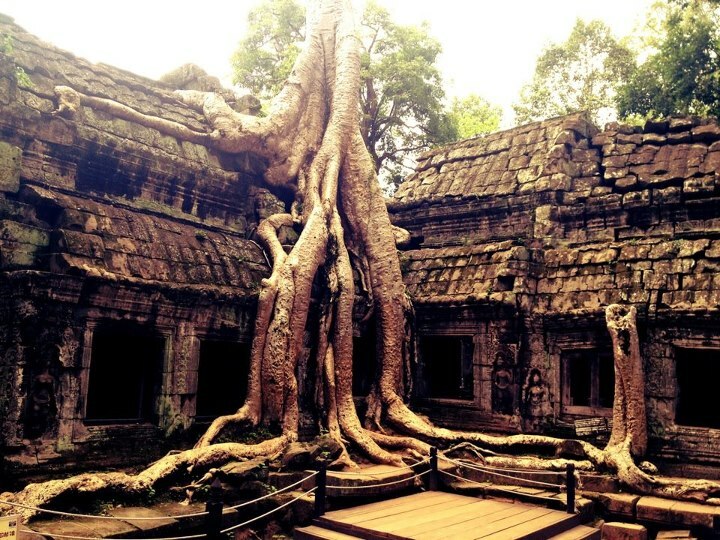 Next stop : Angkor Wat ! Getting up early to catch the sunrise at Angkor Wat is a must do while you’re visiting Siem Reap. Tuk tuk driver picked me up at 4.00 am - yeah way too early, but I didn’t want to miss the good spot to see the sunrise. Saw many tourists on their bicycles riding on the dusty road to Angkor Wat. I remember it wasn’t even 4.30 but people were already there, looked excited to explore the archeological park. 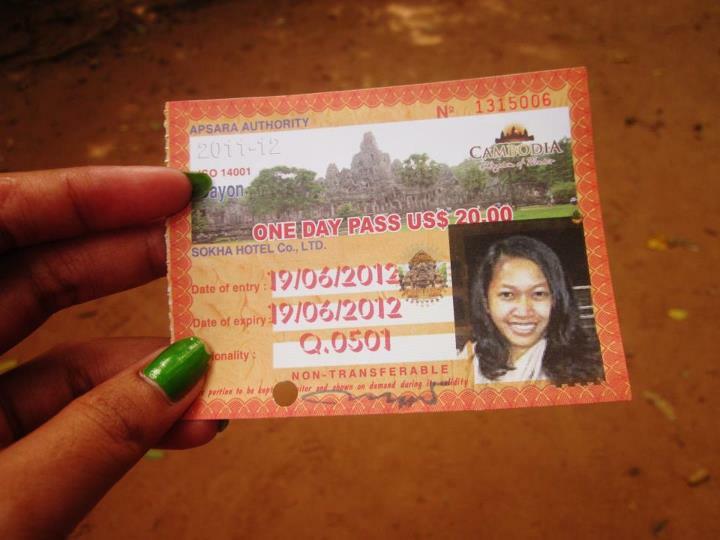 Passes to Angkor Wat purchased at the main entrance on the way to Angkor Wat, they are sold in one day for $20 and three day for $40. If you’re strong enough to explore the whole place in one day, get the one day pass, but if you want to take your times enjoying the beauty of Angkor Wat, the three day pass would suit you well. The weather was so nice in the morning, but it gets very hot in the afternoon. Don’t forget to bring sun glasses, water, and always carry your tickets with you as the officer will always check your ticket every time you enter the temples. Our first stop was Angkor Wat where everyone would sit and wait for the sun rise. Unfortunately it was a bit cloudy, so instead of waiting for sunrise, I decided to walk around the temple. Had a funny experience here, there was a guy offered me incents and told me to pray, I did exactly what he said, after that he asked for some money. I gave him Cambodian riel but he refused it, he said he only accept dollars, for a minimum $10, oh well… then when I was walking around Angkor Thom, another guy came to me and I thought if he offered me incents again then I would definitely say no thank you and leave. Well, he seemed so nice, he showed me some good angles to take pictures and end up asking for money again. Oh ! The same thing, he didn’t want riel, he wants dollars. Lesson from this story : They are such nice and sweet people, but after showing good angles, giving me some incents and convinced me that my wish would come true…of course it was about money in the end. The other thing that steal my attention was all the small kids who tried to sell souvenirs, just like the other tourism places, they will be all around you. All of them told me the same reasons, “Please buy this…please…I need money to make a business.” What sorta business ? Of course they don’t know that, they’re too young to think about business. Even when I asked my tuk tuk driver what kind of business he wants to run if he has money, he has no idea about it. He just wants to earn some money for living, low seasons are never good for him and other tuk tuk drivers or those kids. Its obviously some people teach the kids how to convince the tourists to buy their souvenirs, but its just really shame, they are just kids. While other kids are having fun, playing, go to school, these kids I met at Angkor Wat were busy chasing tourists to sell stuff…to make some money to run a business. 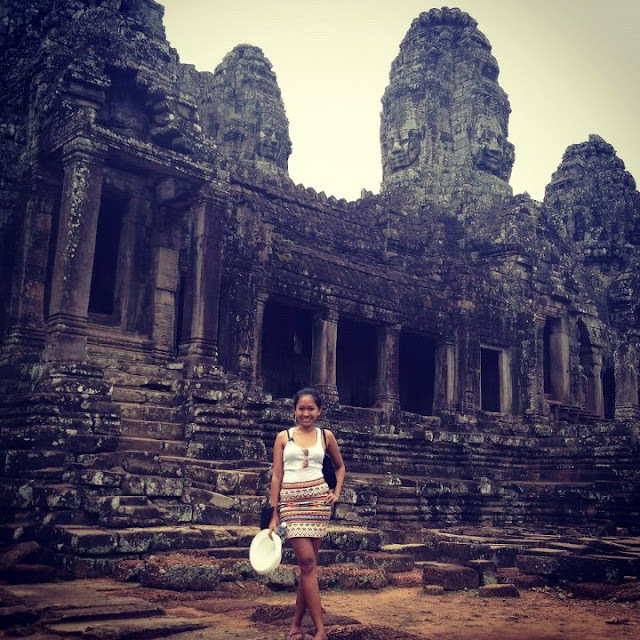 I was incredibly happy to get lost in a beauty of Angkor Wat, feeling so good, free, grateful, loving life. 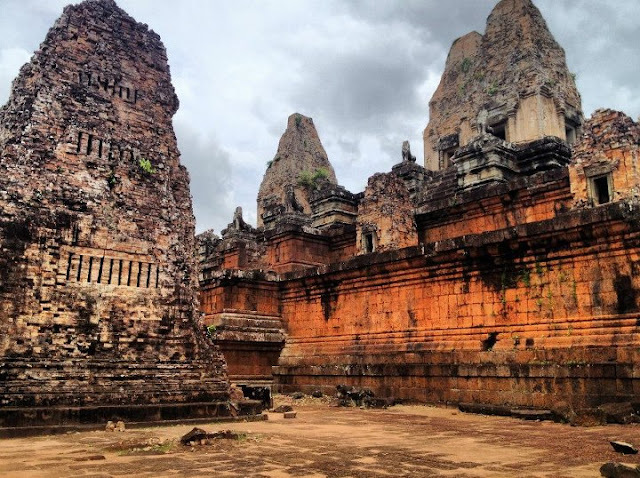 Happy that I decided to do Vietnam and Cambodia for my birthday trip, exploring Angkor Wat, Angkor Thom, Bayon, exiting Angkor Thom by victory gate and north gate to explore some more temples, then Banteay Srey, Phnom Krom. One of my simple joys, just sitting for hours at one of the temples. Listening to my ipod, ate Pringles and looking at the blue sky, enjoying how gorgeous Cambodia nature. Forget about emails, work stuff, big city, I wish I could change my office view with this beautiful view. Took a bus from Siem Reap straight back to Ho Chi Minh, 12 hours bus drive was quite killing me, I was in the bus with mostly of Cambodians people ( there were only 4 tourists including me ), and every one hour the bus stopped cos they threw up, obviously inside and outside the bus, do not even asked about the smell after. Well I couldn’t complain but laughing, and enjoying this is a part of my birthday trip. The smile of a little boy without pants, and an old lady who kept talking to me in Cambodian language even though I kept saying “I’m sorry, I don’t understand, I’m not Cambodian..” still she kept talking to me, smiling and laughing, they all made my day. Thanks for the insight of Cambodia. Can you help me a 5/6 day travel plan in Cambodia (from North to South) and places to stay in respective places?